Even when our looms are working at full speed, people have a vital supervisory role to play. 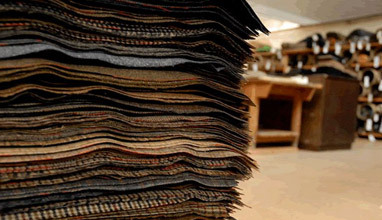 Keen eyes preside over all stages of the weaving process to ensure that each fabric produced by Robert Noble is of the same consistently high quality. Robert Noble was originally established in Galashiels, Scotland under the name of David Ballantyne in 1666 and today - almost 350 years later - it combines centuries-old techniques with modern technology to serve some of the most famous fashion houses in the world.